Geneva, Switzerland, 14 November 2016 – MSC Cruises, the Swiss-based world’s largest privately-owned cruise line and market leader in Europe, South America and South Africa, announced today the opening of sales of its first-ever World Cruise. The MSC World Cruise features the industry’s largest and modern ship to offer this type of extended voyage. MSC Magnifica will depart from Genoa on 5 January 2019 and complete her around-the-world voyage back in Genoa 119 days later. Crossing six continents, calling at 49 unique destinations in 32 countries, this one-of-a-kind world cruise will be an unforgettable dream come true for even the most demanding voyagers, with the comfort and elegance that guests have come to expect from MSC Cruises and its ships. Whether the traditional gap year, career break or a post-retirement adventure, travellers of all ages are looking to broaden their horizons and gain valuable life experiences by travelling the world. 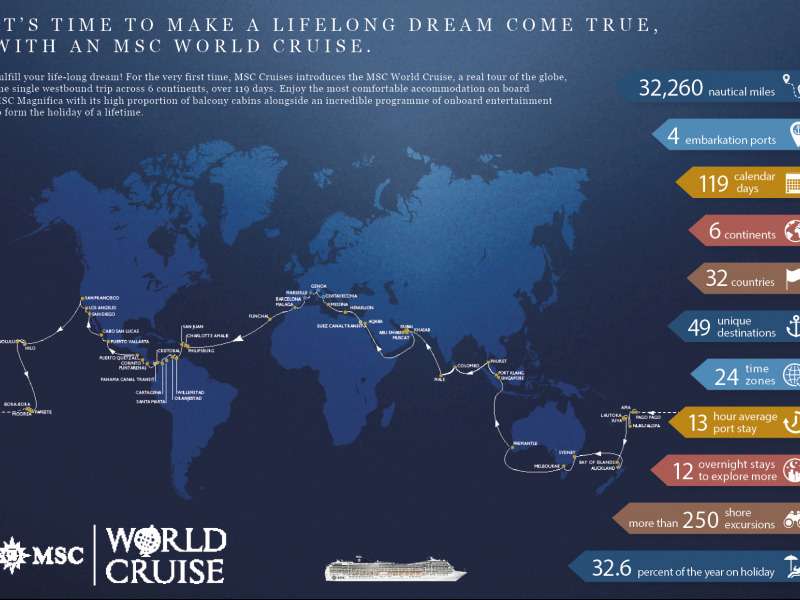 MSC Cruises has created this unique offering to help guests realise their lifelong dreams of world travel. • Exotic and uncharted destinations: From the warm, archipelago of Tonga and the pristine waters of Bora Bora to the thriving culture of Cartagena and oasis of Aqaba, MSC Cruises has hand-selected 49 coveted destinations across the world – many of which are only available to cruise lovers and world travellers alike via this cruise. The MSC World Cruise will also offer guests the opportunity to explore New Zealand, Fiji and the Maldives as well as an expanded comprehensive tour of “off the beaten path” Caribbean islands, with nine ports of call in the region. • Exclusive and unprecedented shore experiences: MSC Cruises continues in its commitment to providing authentic experiences to satisfy the needs of all guests with an extensive choice of excursions. Whether riding the elephants of Pinnawela, snorkelling in the lagoons of Moorea or touring the Nga Bay National Park, guests are able to immerse themselves in local culture and experience the best that each destination has to offer. Furthermore, exclusive to MSC World Cruise, guests will be able to book 15 complimentary shore excursions of their choice to really explore the globe like never before. • True discovery: In order to take advantage of the local culture and activities of each call, MSC World Cruise guests will have plenty of time to explore. With an above-industry average stay of 13 hours on shore per port of call, guests will be able to fully experience and discover at their own pace. • Extended stays in coveted destinations: For popular destinations with a range of activities, MSC Cruises has arranged extended in-port stays that no other cruise line offers, including four full days in Polynesia and three full days in both Hawaii and Los Angeles. • Quality onboard experience: Spending 118 nights on board, MSC Cruises will make guests feel at home thanks to, among others, numerous onboard discounts which include laundry services. Every little detail has been considered to ensure that it is now even easier than ever to make this the voyage of a lifetime. In addition to the immense variety of destinations and experiences to be had whilst on shore, MSC Magnifica will enable guests to travel in real comfort and style. Built in 2009, the ship boasts masterful design and relaxed refinement, with all of the features that distinguish any MSC Cruises ship, including one of the highest ratios of balcony cabins, high quality service, fresh and authentic dining options including four restaurants and 11 bars, modern and comfortable cabins as well as a wide range of entertainment and leisure activities. From the gourmet restaurants serving cuisine prepared with fresh ingredients and authentic inspiration from around the world to the wide variety of world class entertainment offerings including a full-scale casino, panoramic discotheque, cigar lounge, 4D cinema and much more – guests will feel the attention to detail in service and design that is a trademark for MSC Cruises. While there are plenty of activities to enjoy at sea, guests can also opt to escape to relaxation at one of the many on board havens. This includes MSC Magnifica’s award-winning MSC Aurea Spa, with traditional Balinese massages found nowhere else at sea in addition to a number of other ultramodern beauty treatments, a sauna, Turkish bath and thalassotherapy room. Starting November 14, 2016 for one month MSC Voyagers Club members will be able to exclusively book the entire 118 night cruise with sales opening up to the general public on December 14. Round trip embarkation/disembarkation ports of call include Civitavecchia/Rome, Genoa, Marseille and Barcelona.